Westward Ho! is the only place in Britain that features an exclamation mark as a part of its name. This makes it sound vital and pioneering, as though overrun with pirates and pilgrims and maybe a cowboy or two. I spent most of my childhood in North Devon, and despite coming from a family who went out exploring at every opportunity, I don’t remember ever coming here. 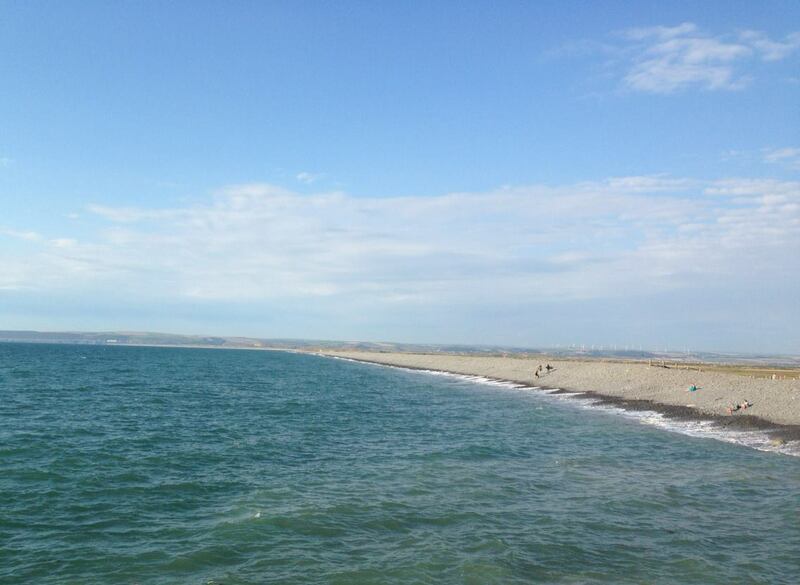 So today I decided to have a quick swim in the lovely Atlantic after a shift at Bideford. I followed signs to the sea-front and parked for 85p next to a cafe and amusement arcade. Paying the fee necessitated entering the cafe, which was constructed entirely from plastic and overrun by people scoffing piles of anaemic chips, fried eggs, sausages the colour of exposed northern skin, beans, and bowls of what looked like diarrhoea, but which turned out to be ‘curry sauce’. I left with the uncomfortable feeling that the perspiration on my brow had been impregnated with chip fat. Trotting Westward Ho! I stared at the crowd of plastic tat-filled shops and cafes, designed to fleece visitors of every last penny. Clambering along the shingle bank was a relief; I stripped fast and tottered into the sea at high tide. It was warm and bouncy and deeply greeny-blue, with a nice thermocline in which my toes dangled from time to time as I bobbed. The smell of fried crap lined my nostrils like the scent of death, even when I looked out to sea. Next time I’ll swim at Northam.